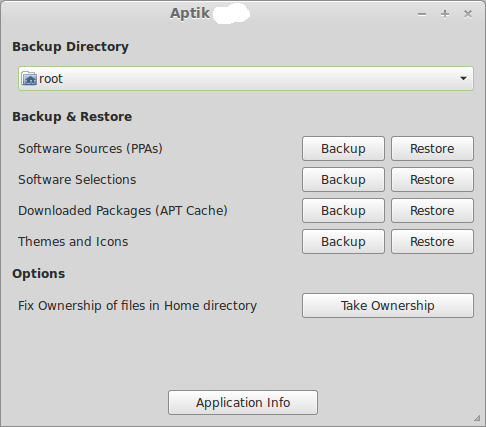 Aptik is a new tool to simplify re-installation of packages after doing a clean installation of an Ubuntu-based distribution. It can be used while re-installing or upgrading to the next Ubuntu/Linux Mint release. Upgrading to the next release of an Ubuntu-based distribution can be a painful task. While most Ubuntu-based distributions provide an option to upgrade your existing installation, it can cause a number of problems. It sometimes results in broken packages. If proprietary graphic drivers are in use, the system may boot into a black screen after the upgrade. The look and feel of the new release is lost since the previous desktop settings are used. In order to avoid problems most people prefer to do a clean installation. They download the ISO image, format the system partition, and then install the new release. You get a good feeling when you boot into your shiny new system. Then you realise that you need to re-install all your softwares again and your excitement goes down. Aptik is a new tool that will make your life easier. While it won't eliminate all the work that needs to be done after a fresh installation, it will reduce it greatly. The main window has undergone some changes. New toolbar is added with buttons for each action. 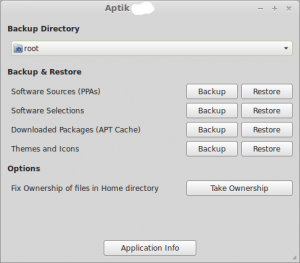 New option to backup and restore settings for an application. Aptik will list all hidden folders in your home directory which contain config files for various applications (Firefox, Chromium, etc). 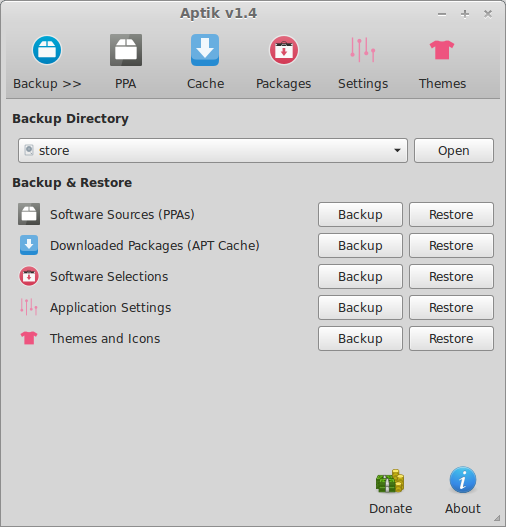 You can select the folders to backup and restore. For example, to backup the settings for Firefox (bookmarks, addons, etc) select and backup the folder ~/.mozilla. This folder can then be restored after doing a fresh installation of Ubuntu to restore your Firefox settings. Similarly, in order to backup the current state of torrents being downloaded by the Deluge Bittorrent Client, quit Deluge and backup the folder ~/.config/deluge. After restoring on the new system you can continue downloading the same torrents. Restoring the application settings in this way can sometimes cause problems. For example, if the new system has a new version of the application then it may have problems loading the config files created by previous version. If you face issues after restoring files, you can "reset" the application settings using the ‘Reset' button. This will delete the selected config directory. New config files will be created automatically (with default settiings) when you run the application next time. A number of bugs were fixed. There was an issue while adding PPAs on on some systems. A log window will be displayed with error messages in case of errors while adding a PPA. Hard-coded icons have been replaced with icons from the system theme. Hard-coded icons will be used if the current icon theme used on the system doesn't have the required icon. Wonderful application. I recently installed Ubuntu 14.10 and everything worked fine after recovering previous aptik backup, including software, settings, Dropbox configuration (with thunderbird sync), Firefox settings with plugins, xmarks. Really a must have to save hours of downloading and tweaking. Could someone please make this for OpenSUSE, that way Linux users and people fed of with Windows can be a step closer to sharing software/packages been the two popular distros and have more options for software selection. Windows has a massive selection for it’s various versions, so this would really help to make Linux on par with Windows better. Please let me know if anyone does this.